Apple Watch is one of the hottest products of the year. 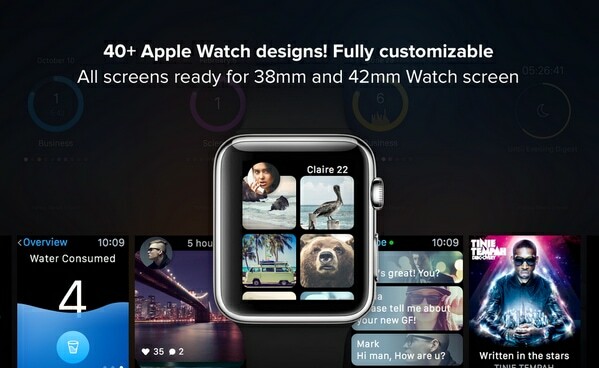 Designers are going wild with their concepts for watch apps and mockups. 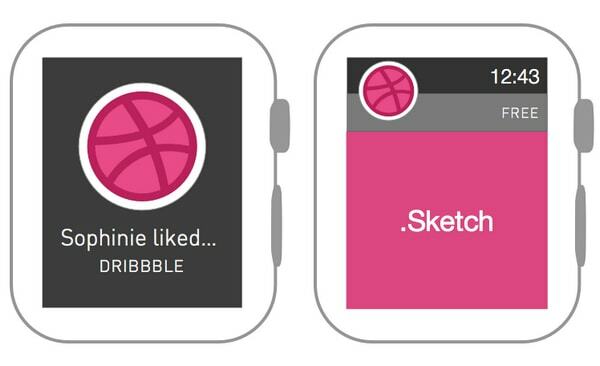 Behance and Dribbble are filled with incredible, sophisticated and pioneering UI designs for the Apple Watch. If you are still feeling the frenzy over this high-tech gadget, then this post is just for you. 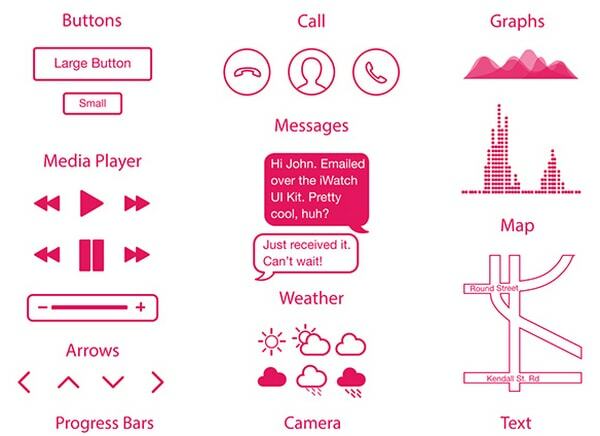 WATCH APPS CONCEPT GUI 2.0 is a massive bulk created by a real master of the craft. The pack includes more than 40 outstanding pixel-perfect user interface designs that can be quickly customized to your needs. The artist has taken into account both screen sizes (38mm and 42mm) in order to meet different preferences of the audience. 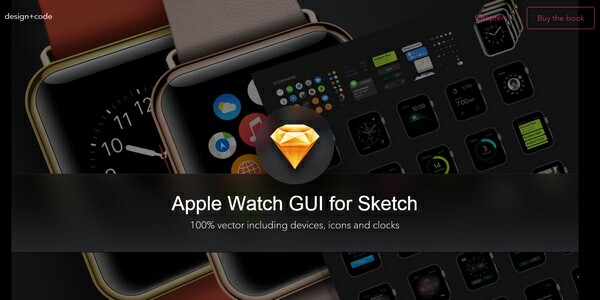 Apple Watch GUI for Sketch is designed for SketchApp fans. This enormous pack can be broken into three parts: sleek semi-realistic mockups of a device, set of vibrant, refined circular icons, and a whole slew of brilliant screens that bring to life various functions. Each item is 100 percent vector, retina-ready and meets Apple guidelines. Apple Watch UI Assets is another gem for those who prefer to turn down the Goliath of image editing industry and go for a less complicated, but more design-oriented instrument provided by Bohemian Coding. As usual, the kit covers a dozen of carefully crafted user interfaces that comply with dimensions of each Apple Watch device. 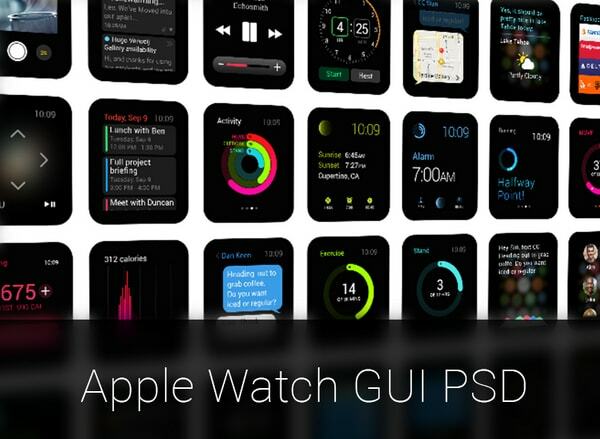 Apple Watch UI Kit lets you clearly visualize a concept providing clients with a sleek and subtle wireframe mockup. Everything from basic buttons to nifty flow charts are made through a modern combination of flat style and contour style that add to an interface a sophisticated and elegant feel. Photoshop enthusiasts and amateurs, behold, this package will certainly become a real gem of your toolbox. With an astonishing variety of professionally executed app screens, this kit will give you a significant boost in this sphere. 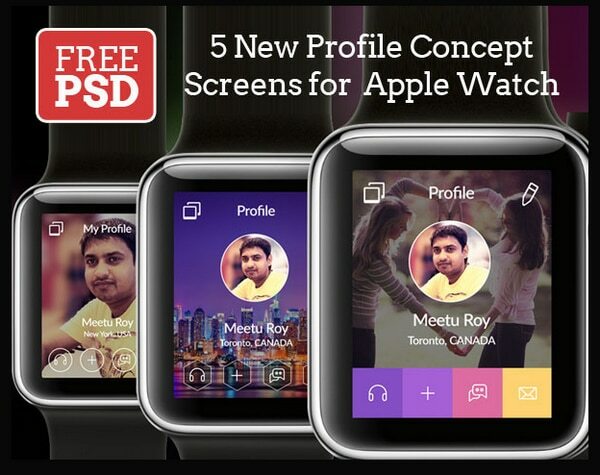 It simplifies UI prototyping for iWatch by providing excellent samples that can be easily customized and used separately. 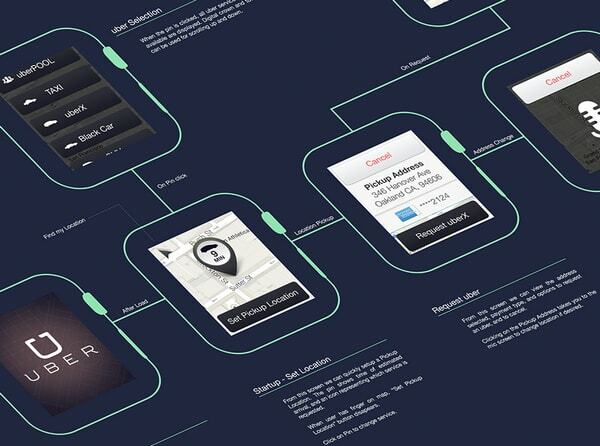 Edwin Delgado succeeded in creating an alternative variation of Uber interface for the Apple Watch. The freebie includes a dozen elaborate screens that represent different functions in a visually-appealing way. The designer features both flat style components and those that are more skeuomorphic in nature. 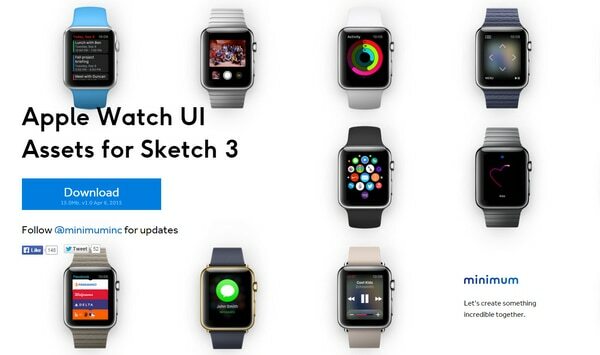 The author helps you to get off the ground and create your first amazing and well-crafted UI design for Apple Watch 42 mm. In order to experience the whole power of the kit you need to install a SketchApp 3.2, download Apple’s choice “San Francisco” font and a template of the device itself. Amit Rai shows was to vividly to display your profile that will appeal to users, and at the same time, will not look bad on tiny screens. He offers five top-notch fully layered and precise PSD templates that let you shed a light on your persona in an attractive manner. Each screen is marked by a gorgeous coloring and nifty line iconography. 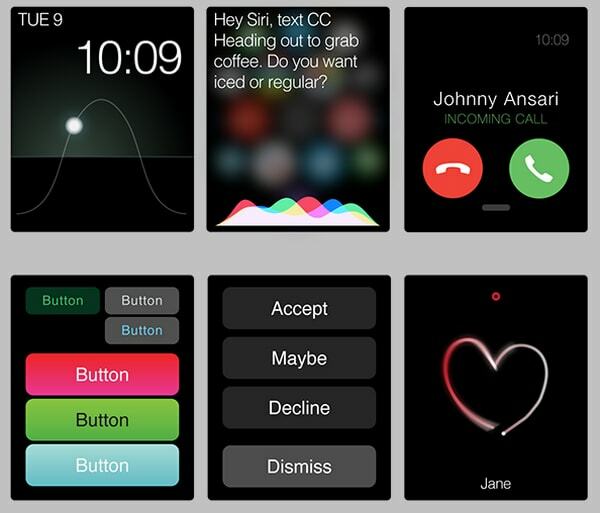 Johnny Ansari shares with users six subtle screens that comply with Apple Watch standards. Here you will find such essential components as buttons, icons and multi-colored charts. 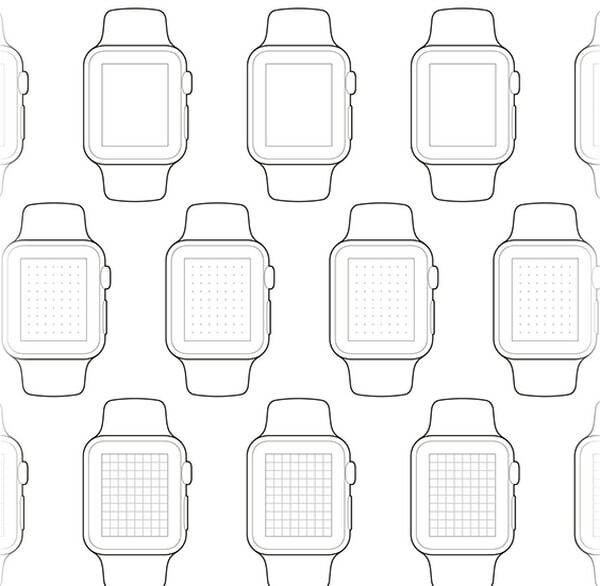 This free file includes a clean, vector wireframe-style mockup of the Apple Watch. The beautiful frame app screen designs are presented in an appealing fashion. Moreover, the designer has included several sample layouts such as short-look and long-look notifications that entirely correspond to Apple’s requirements. The pack is designed for those who build interfaces for iOS8-powered devices, and need a perfect template for creating an icon. 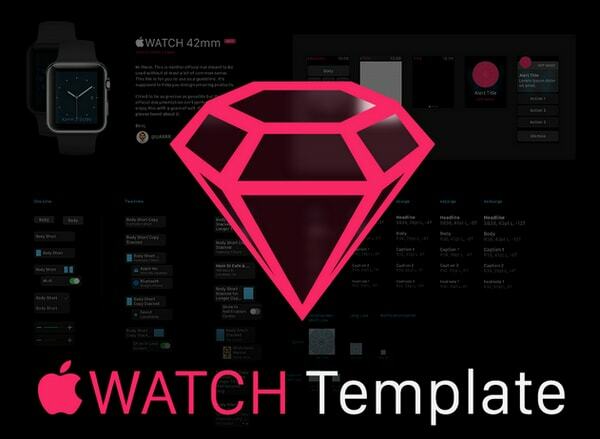 Here you will find clean and intelligible templates for iPhone, iPad and, of course, Apple Watch. The kit is well-suited for working in Photoshop CC. Thomas Mirnig intends to supply designers with a great instrument that will make prototype sketching a piece of cake. The freebie includes clean and skillfully executed paper wireframes with original sizes of Apple’s smart wearables, i.e. 38 mm and 42 mm, presented in DIN A4 and U.S. letter. It will help to visualize your idea offline quickly. Much like the previous example, this smart and sought-after freebie is aimed to turn doodling into a real prototyping with the help of standardized paper-based wireframe template. 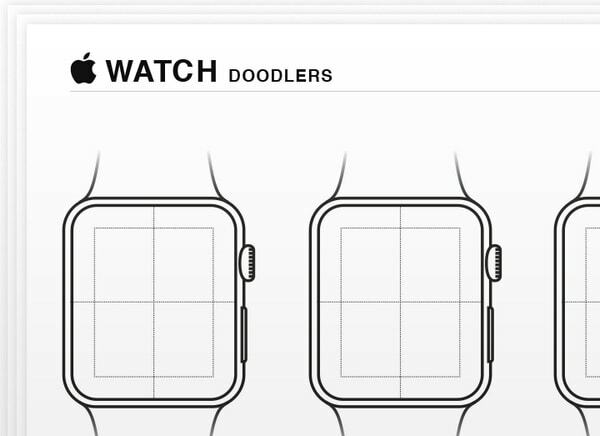 It has a dozen of neat and delicate line style Apple Watch devices with a handy grid. Just print and enjoy. When it comes to adaptation and export of Apple watch icon into Xcode, there is nothing better than this small, yet intelligent freebie that greatly assists you in this matter. It meets specifications for both 38 mm and 42 mm devices and helps solve fundamental issues. The kit embraces various default sizes of icons. With this helpful template, you will be able to adapt icons without the hustle and bustle for Notification Center, long-look notification screen, home screen and short-look notification. From packs of smooth, vector, retina-ready fundamental components to smart templates for adjusting icons for different standard sizes, we have tried to fill all possible gaps, providing you with all necessary instruments for getting started with building your own tiny user interface for Apple Watch. If you have something to add to our collection, don’t be shy, share it in the comments.